A hand blender, also called an immersion blender, wand blender or stick blender, is a really convenient too to have in your kitchen simply because it’s easier to pull out than a countertop blender or food processor, simpler to clean, and uses fewer containers and parts for the job. Of course, not everything can be done with a stick blender but you can generally make soups, purees and sauces quite easily. To make them even more versatile, you can get a hand blender with chopper attachment to chop soft and medium firm fruits and veggies. We’ll show you our top picks for best hand blender and chopper to buy. Before you buy one, know what to look for in this type of appliance. Most standard immersion blenders can do all the above basic jobs with a 200 watt rating. However, if you want it to be able to crush ice for smoothies, you should look for nothing less than 300 watts. The chopper attachment similarly needs a higher rating for chopping larger quantities of foods at a time. The actually stick has to be attached to the drive on the lid of the chopper jar, which in turn powers the blades. Also look for the number of speeds available. The basic models generally come with just low and high settings. If you want more control, then you’ll need more speeds in between. Some stick blenders also come with a whip attachment and even a larger blender storage jar so you can make your smoothie directly in that and then seal and take it with you to the gym or office. For the chopper attachment, the blender has to fit nicely with the chopper drive so that the chopping job is smooth. The blades should have wide coverage and reach as close as possible to the sides of the jar so as to chop as fine as possible, otherwise you’ll get some chunky pieces and you’ll have to scrape the sides down and do it again. Some blenders require you to press and hold down the “ON” button while you use it, so if you think that’ll be a problem then look for a one that you switch on and off. Since buying a hand blender with chopper means simplifying life in the kitchen, make sure that all the parts are easy to clean. If you want to blend and process larger quantities or make dough, you will need an actual food processor, like any of these. You can also get a combination food processor and blender. With all that in mind, let’s look at the top rated chopper hand blender options below. This Braun hand blender chopper gives you the flexibility to not only blend, but whisk, puree, and even cut your fruits and vegetables into French fry shapes. Eleven bars on the indicator tell you how much power you’re getting. The more you press the speed control, the more power you get. The hand blender has a 400W power rating and you can control it with one hand and a comfortable, ergonomic, soft grip and easy click system. You have many options with the included accessories that help you mix and cut however you want. The hand blender comes with a beaker, whisk, blending shaft, masher, 6-cup food processor, chopping blade, insert holder, and julienne, fine and coarse slicing and shredding inserts. There’s also a french fry tool that will allow you to cut your fruits and vegetables in fun shapes. You can make anything from smoothies to pizza dough with all of the features included. Yes, it will knead your dough for you. The powerbell technology gives you uniform results without creating too much suction force, so almost any blend of foods can be mixed thoroughly without the splashing. The safety button helps to prevent accidents. The blender works efficiently and accurately and is easy to clean. However, there’s an automatic shut off feature that will cause the blender to stop working in two seconds if you stop pressing the power button. You have to unlock it again before you switch on the power button. The Braun hand blender chopper attachment may not be able to to take on large, complex jobs, but for small to medium projects, it does the trick and can replace a mini food processor. Braun has a great reputation for the quality of their products. Another brand that makes a really good stick blender is Breville and we picked the Breville BSB510XL model as one of the best immersion blenders overall. 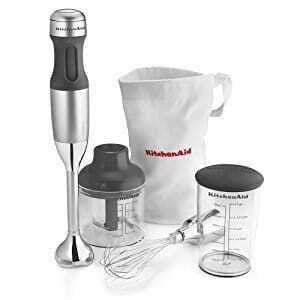 The KitchenAid KHB2351 3-Speed Hand Blender gives you the flexibility to make smoothies, milkshakes, baby food, chop nuts, vegetables, or other firm foods, and whisk egg whites or mayonnaise. Your options don’t stop there. You can process harder cheeses and create crusts for baking. You can make omelettes, vinaigrettes, or as many blended drinks as you want. The 3-Speed Hand Blender weighs only two pounds, has 215 power wattage, and comes with a removable 8-inch blending arm with a fixed blade, a 2 1/2 cup BPA-Free chopper attachment with a lid, a 3 cup BPA-Free blending jar with a lid, a whisk attachment, and a storage bag. It is built with a soft grip handle so you won’t get uncomfortable while you’re working. You can move around with ease using the 5 ft electric cord. You can store your shakes, baby food, and cooking ingredients in the 2 1/2 and 3 cup jars before and after blender use. The long handle lets you mix right in deep pots. The KitchenAid blender itself is made of strong metal that will take the wear and tear of cooking. This brand won’t become overheated during blending. There is one flaw in the Kitchenaid immersion blender chopper attachment. Water becomes trapped in the lid but no one has had a problem occur because of that. It is also a bit tough to disengage the blending shaft from the chopper if your hands are greasy and wet. It works better as a mincer rather than very even grinding of nuts, etc. The blender does a very good job making soups and purees. If an 8″ blending arm is not long enough for all your pots, or you want more versatility and control while blending, then choose the 5-speed Kitchenaid brushed stainless steel model. With this one, not only do you get two additional speed settings, but you also get a a second blending arm that is 13″ long. No pot’s bottom is too deep for this one! You also have 3 interchangeable bell blade assemblies so you can choose which one to use for individual tasks, like pureeing hot soups or baby foods, making smoothies or crushing ice, chopping onions or nuts, etc. There is also a whisk attachment for making meringue, vinaigrettes and mayonnaise. The chopper attachment can be used with the 2.5 cup jar with locking lid, while both the blending arms can be used with the 1 litre blending pitcher with no-splash lid. All the removable parts are dishwasher safe and they can be stored in the included storage case. The 5-speed option also comes without the 13″ blending arm if your pots are not that deep and you want to reduce the cost a bit. This is the black or silver model. In this case, the 1 litre pitcher is replaced by a 3 cup blending jar. The Epica 4-in-1 Immersion Hand Blender will give you powerful results with a small amount of work. This plastic hand blender gives you a 350w motor. The one-handed catch and release allows you to work with ease. The 2-speed technology allows you to work with low and high speeds as needed. You can use more power for cutting up vegetables and frozen fruit, or less power for mixing soft ingredients such as egg whites. The blender comes with a 3-cup blending and storage jar, a 2-cup chopping and storage bowl, a whisk attachment, and the blending attachment. You can use the 2-cup chopping and storage bowl to break up your vegetables to small pieces. You have variety because you can make salsas, guacamole, milkshakes and smoothies, yogurts and baby food! The blender’s parts are all dishwasher safe, making for easy cleanup. It does a fast job with any project you give it. There may not be a big difference between the speed options so you have to make sure you check your mixes to ensure that it’s the consistency you want. But for a hand-held blender, you’re getting great value. If you like mixed drinks, the power handles ice and frozen fruits with ease. The Ovente 6-Speed 500 Watt 3-in-1 Immersion Hand Blender gives you everything you need to make all of your favorite drinks, accompaniments, soups, marinades, and much more. The blender comes with a stainless steel mixing stick, a stainless steel whisk, 500 ml food chopper and a 20.3 ounce BPA-free beaker with measurements. The food chopper has stainless steel blades. The blender has a soft ergonomic grip that will make it comfortable for you to work. You have six variable speeds controlled by an LED lit dial and a soft-touch turbo button that gives you a pulse option. The parts are dishwasher safe for easy cleanup. The Ovente hand blender with chopper and beater gives you a lot of value and has a higher power rating than the others. You have to work a little hard to get the snap attachments secure and there’s no case for storage, but you’ll find that the features make up for the cons. You’ll enjoy this hand blender for a long time. The stainless steel Aicok Immersion Hand Blender gives you so much to do in such a small space. The 4-in-1 functions allow you to blend, whisk, chop and cut, allowing you to make many different items. You can even mix batter for baking or pancakes. With the Aicok 5-Speed Hand Blender you get a 500ml chopping bowl and lid, an 800 ml measuring cup, a blender stick, a whisk, and a whisk holder. You can use the chopping bowl to cut and chop fruits and vegetables for salsas, guacamole, and dips, hard cheeses, nuts, cooked meat, or chocolate for a delicious sauce or topping. The blending jar is great for drinks and dressings. The whisk attachment will help you mix eggs for baking or creams. The Aicok hand blender gives you 350w power. The parts are easy to clean and store. Anyone who loves hand blenders will be satisfied by the durability of this blender. An inexperienced user will be surprised at how easy it is to use. You’ll need to watch your speeds as even the low power setting is powerful. Otherwise, you won’t find any disappointments with this immersion blender chopper.